PITTSBURGH, PA, July 17, 2013 – Vector Security, the provider of intelligent security solutions tailored to the needs of the customer, recently donated $9,000 to the National Center for Missing & Exploited Children. 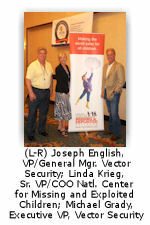 Over the last nine years, Vector Security has raised more than $40,000 for the organization. “We are proud to support the National Center for Missing & Exploited Children and their efforts to help find missing children, reduce exploitation and prevent child victimization,” said Michael T. Grady, Executive Vice President, Vector Security. The money was raised as part of an annual Technical Service Provider (TSP)Appreciation Event hosted by Vector Security. The event is an opportunity for Vector Security service partners, manufacturers and distributors throughout North America to network as well as support an important cause through their sponsorship of the event. “On behalf of Vector Security, I would like to thank all of our business partners for their contribution to the Center,” Grady said.